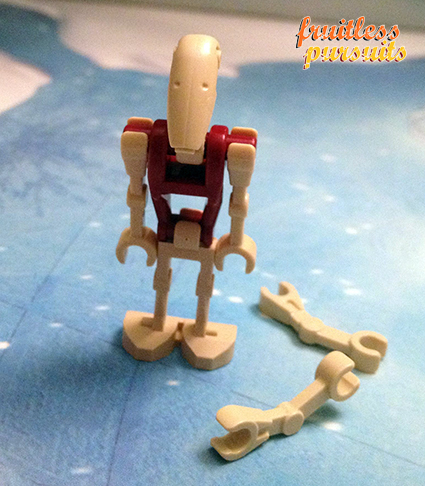 Fruitless Pursuits: Lego Star Wars Advent Calendar 2012, Day 6: Roger Roger! 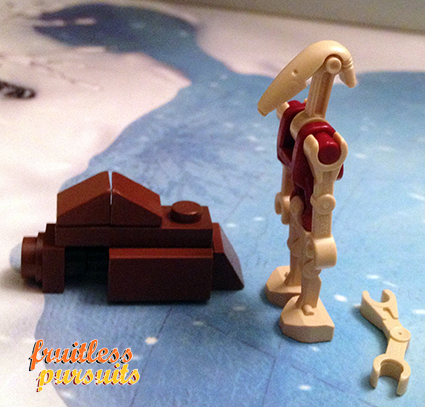 Lego Star Wars Advent Calendar 2012, Day 6: Roger Roger! After yesterday’s now legendary Brown Blob of Despair scenario things are slightly back on track today although extremely predictable. 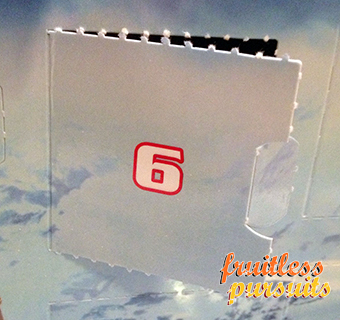 There’s only one thing I’ve been expecting today behind the mighty cardboard flap of Door #6 today! To find out what it is... join me after the jump! We’re overdue a minifig and seeing as how we got the MTT droid transport tank yesterday (assuming you lowered your expectations and used your imagination) so my force prediction for today is a battle droid to accompany it. Do I have my force powers back? Yep! It's still a brown block of crap! Something of note though, this battle droid is packed with two different sets of arms, one pair straight and the other pair curved. For holding some kind of weapon perhaps? I wonder when we’ll receive that... WINK! In our ongoing competition between the Playmobil Game of Thrones Advent Calendar and this one, I’m going to award Lego the point today but only by the narrowest of margins and because I think that, generally speaking, minifigs are awesome. But Lego is going to have to surprise us with some pretty amazing stuff if they want to take the prize. I've been enjoying reading your blog almost as much as I've been enjoying opening my own star wars calendar. You also opened my eyes as to what the hell yesterdays droid transport was. So thanks and keep it up! Thank YOU for reading! We do our best to make everything entertaining so be sure to poke around! But otherwise, rest assured I am committed to this calendar journey, no matter how depressing it gets.